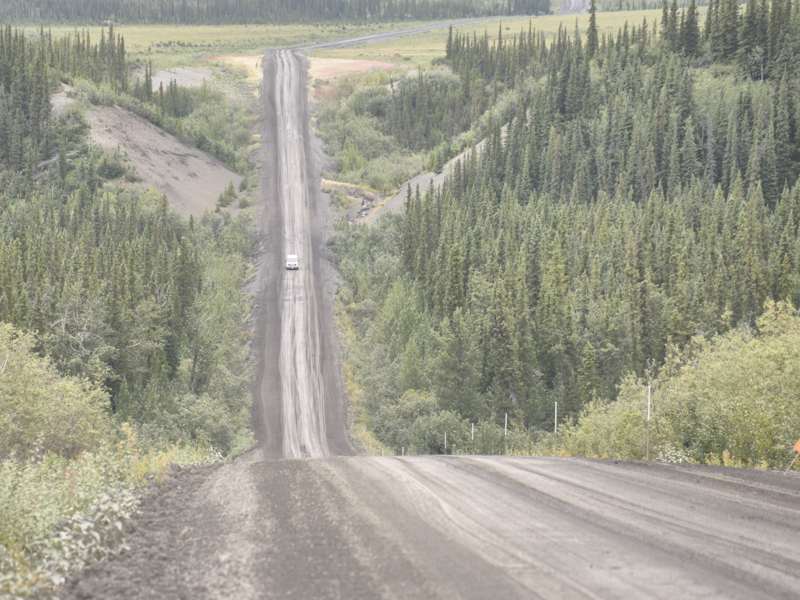 This is another belated report on my August 2012 travels in northern Canada, this one on the Dempster Highway (YT 5/NT 8) from the Klondike Highway near Dawson City YT to Inuvik NT. That was part of a two-and-a-half-month road trip the year after my retirement, covering over 23,000 miles including many of the bad roads of the Arctic. The Dempster is one of those "bad roads", but not the worst one I traveled on that road trip. 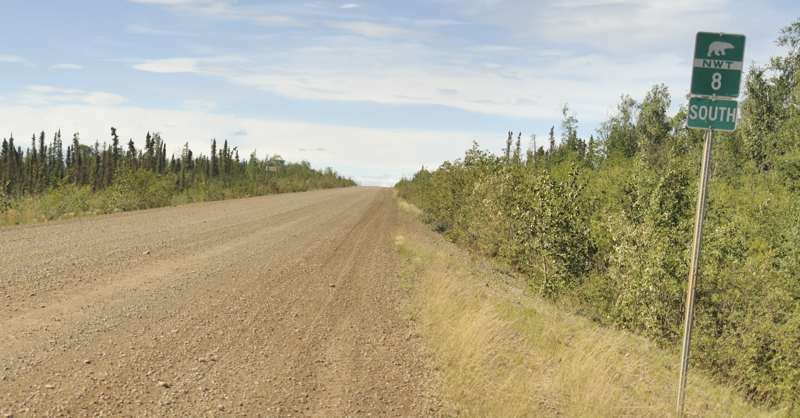 The Dempster Highway was completed in 1979, giving Inuvik and some other communities in the Northwest Territories their first all-season road link to the rest of Canada's highway network. It is named for Cpl. W.J.D. Dempster of the Royal Canadian Mounted Police, who in 1911 led the search party for the "Lost Patrol" out of Ft. McPherson, which got lost and died en route to Dawson City. 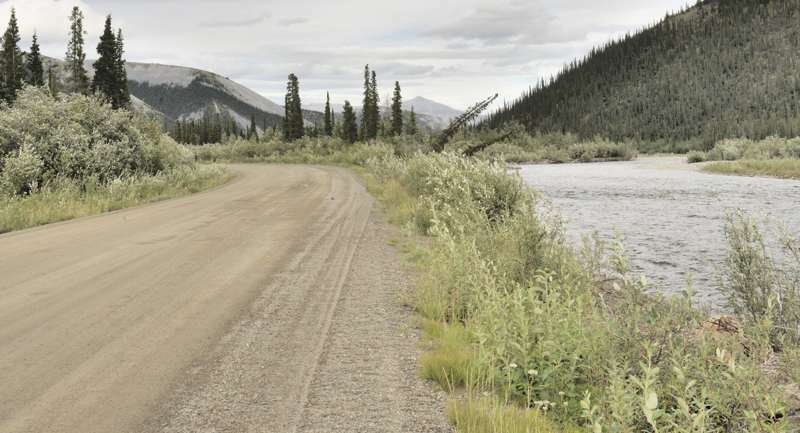 The Dempster is an all-season road, though subject to winter weather closures. It also has two ferry crossings, which close for several weeks in the fall and the spring (in the winter, ice bridges replace the ferries), with the spring closure often extending into early June. Average daily traffic counts are in the 100-200 range for the peak summer months. The highway has limited travel services, with an especially long gap on its south half. Fuel is available only at the south end (a public cardlock station, which replaced a staffed truck stop that burned down after my 2012 trip), the Eagle Plains truck stop at km 369.2, Fort McPherson NT another 181 km to the northeast, and Inuvik NT about 182 km past Ft. McPherson. 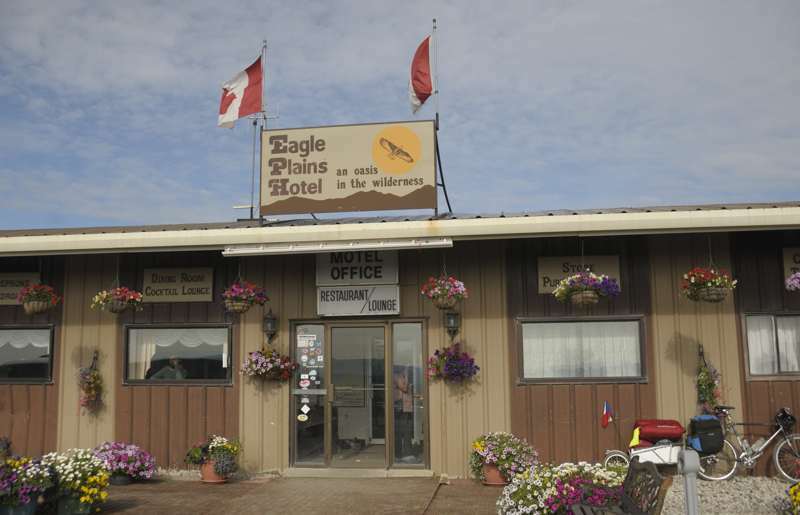 Also, there is little or no cellphone service, except in Inuvik and perhaps Ft. McPherson, plus the limited wi-fi network at the Eagle Plains motel. Food and lodging are also available in Dawson City YT, Eagle Plains, Ft. McPherson, and Inuvik. Indeed, I stayed twice at the Eagle Plains Lodge, on the way both to and from Inuvik, to cover the highway in four days. 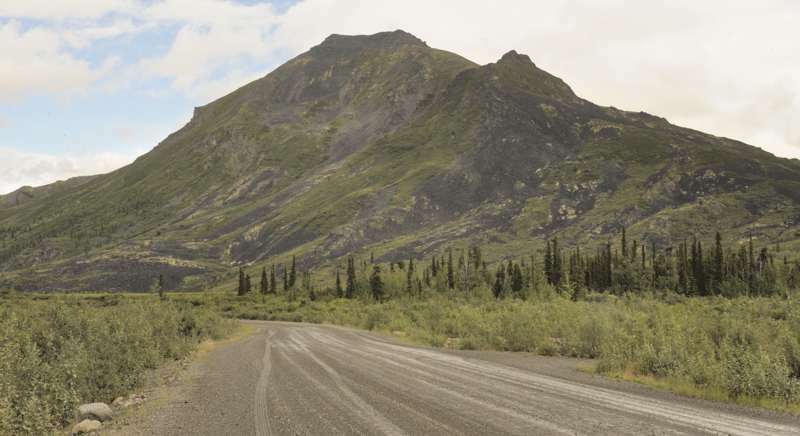 The highway can be traveled without an overnight stop, with abundant summer daylight (especially north of the Arctic Circle), with the Milepost guide to Arctic highways estimating the one-way trip at 10-14 hours if you're in a hurry and not that interested in viewing the scenery along the way. Almost all of the highway is unpaved, except a few km of pavement at each end, with a 90 km/h posted speed limit. 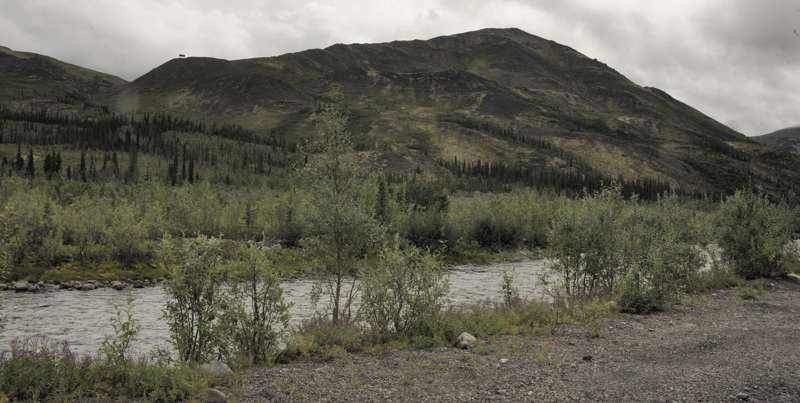 The Milepost strongly advises travelers to bring two mounted full-size spare tires, due to both the extreme distances between tire repair facilities, and shale gravel surfaces in some places that can cut up even the strongest tires. Indeed, a Milepost crew updating its log of the Dempster got two flat tires. OTOH, I saw several bicyclists in two groups riding on the highway when I drove it. They looked well-equipped enough to be bringing spare tires, in addition to the usual patch kits. All of the photos below are my own, and unless otherwise noted were taken in August 2012. A few are from my August 2018 return trip to Inuvik, to travel the new Inuvik-Tuktoyaktuk Highway. ^ The south end of the Dempster Highway (YT 5), at its junction with the Klondike Highway (YT 2). 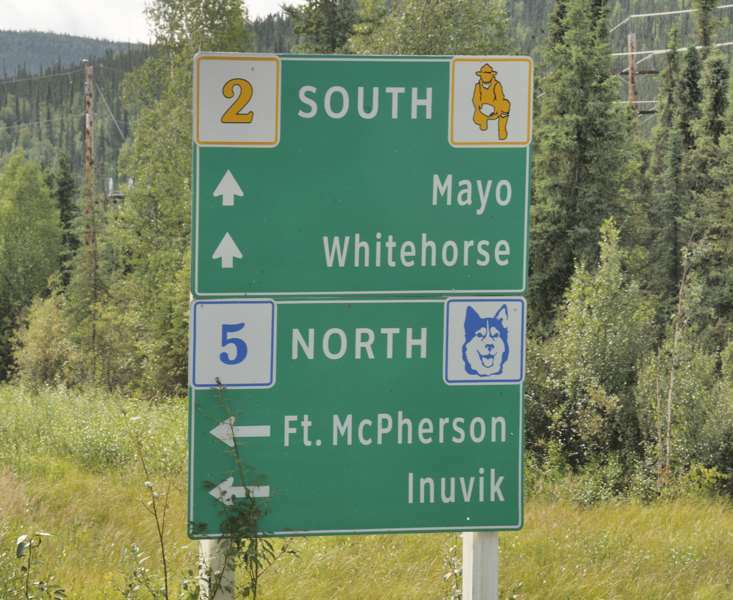 This sign shows for both highways the route number marker and route icon (for the Dempster, a sled dog like one in the search for the Lost Patrol; for the Klondike, a gold miner). 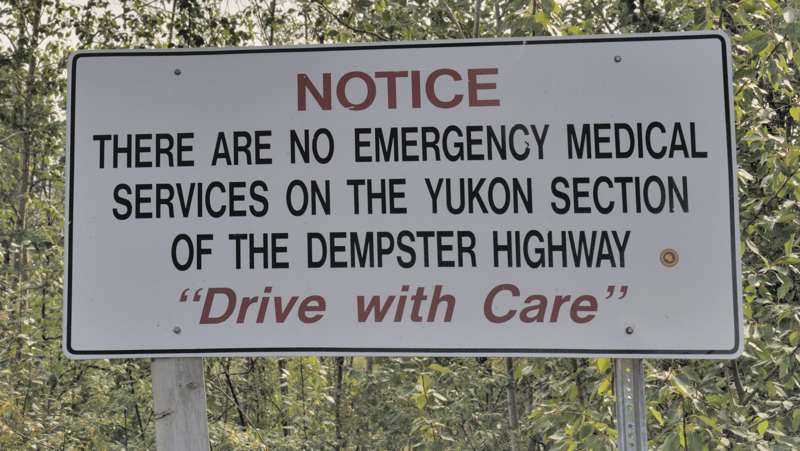 ^ A reminder that there are no emergency medical services in the Yukon's part of the Dempster. 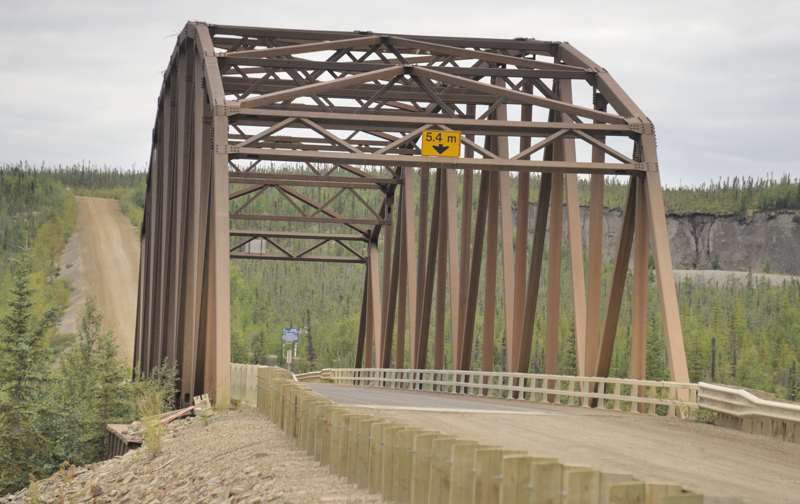 ^ Three-span pony truss bridge over the Klondike River, at YT 5 km 0.3. ^ The first distance sign on the Dempster, at YT 5 km 1.3. ^ ^ Two scenic views from an unofficial parking area at YT 5 km 66.6. The first photo is to the south, of the highway and Fold Mountain. The second is to the east, of the Klondike River and Outrider Mountain. ^ From YT 5 km 126, a scenic view of the mountains northeast of the highway. ^ The northbound highway, at km 144.2, runs along the Blackstone River. ^ At YT 5 km 195.5, this three-span pony truss crosses the Ogilvie River. This photo is from the northwest, on the access road to the highway maintenance camp immediately north of the bridge. ^ That maintenance camp doesn't exactly put out the welcome mat for travelers. ^ An overview of the Ogilvie River Valley, probably at YT 5 km 297.9. 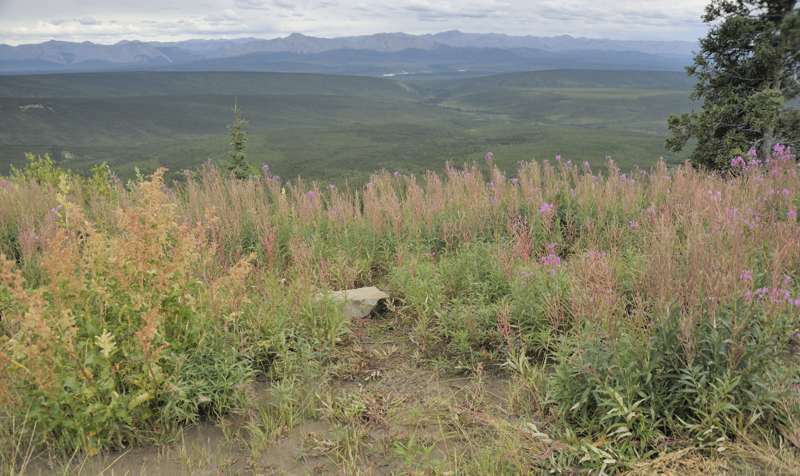 The fireweed in the foreground indicates a recent fire in this area. 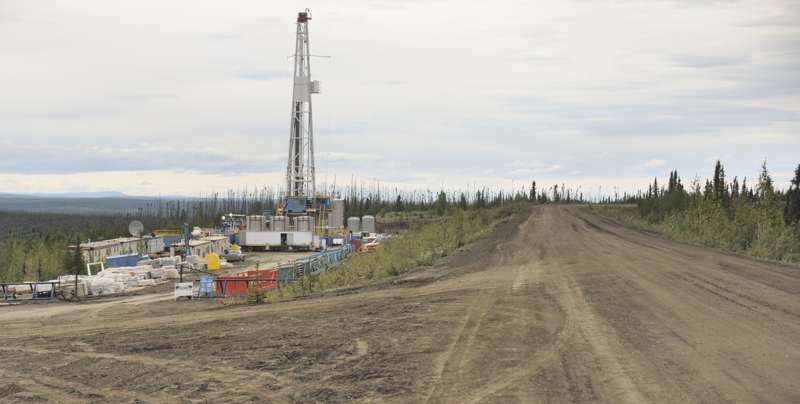 ^ A drilling rig, along YT 5 around km 315. ^ The northbound Dempster approaches the Eagle Plains truck stop at km 369.5, a welcome sight for travelers running low on fuel after hours of driving without seeing any gas stations. ^ The front entrance to the Eagle Plains motel and restaurant. 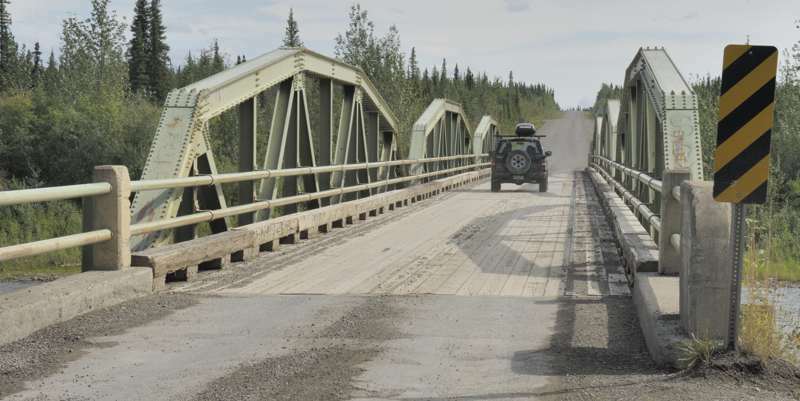 ^ At YT 5 km 377.8, the through truss bridge over the Eagle River. ^ The north end of the Eagle Plains Airstrip at YT 5 km 389.5, one of several on the Dempster shared in whole or in part with specially widened and straightened highway segments. These airstrips have only windsocks, the gravel runway/highways, and gravel plane pullouts, with no control tower, terminal building, or other facilities. Flights take off and land only in the daytime, operating under visual flight rules. Highway traffic is normally light enough to avoid conflicts, but is required to keep moving through the airstrip. 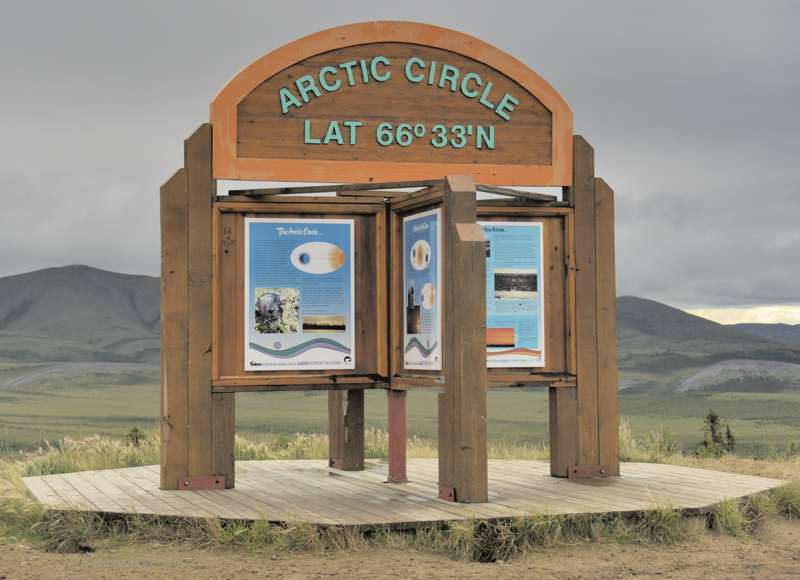 ^ The Dempster crosses the Arctic Circle here, at YT 5 km 405.6. Along with these interpretive panels, there also is a rest area with outhouses and other facilities. ^ A really roller-coastery stretch, at YT 5 km 433. 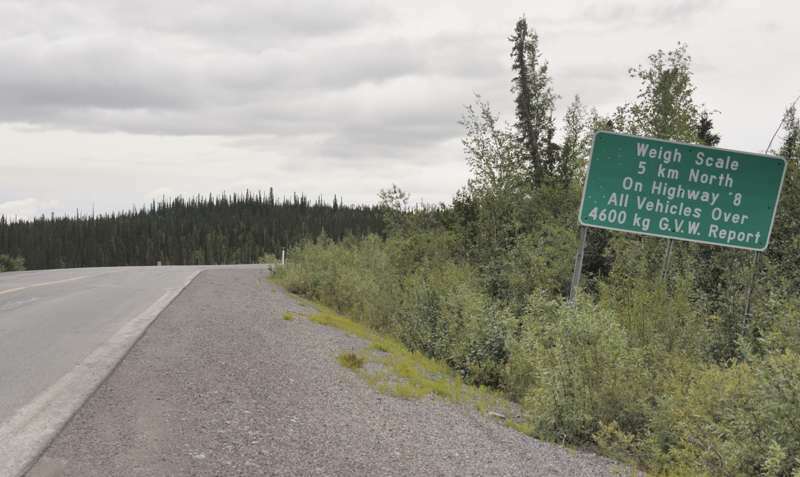 ^ ^ Signage at the Yukon-Northwest Territories border, for the northbound highway (YT 5 km 465), and southbound (NT 8 km 0) entering the Yukon. There is also a parking area and litter bins. The border is a continental divide, so if you pee right on the inexactly-marked border, the part on the Yukon side will head toward the Pacific Ocean, while on the NT side it will flow toward the Arctic Ocean. ^ This is marked as an "emergency airstrip", at NT 8 km 49. But it is the runway (shared with the highway, like some other specially-widened and straightened segments in the Yukon) for Midway Lake's town airport. ^ A view of the northbound highway's descent to the Peel River ferry crossing, from around NT 8 km 67.8. 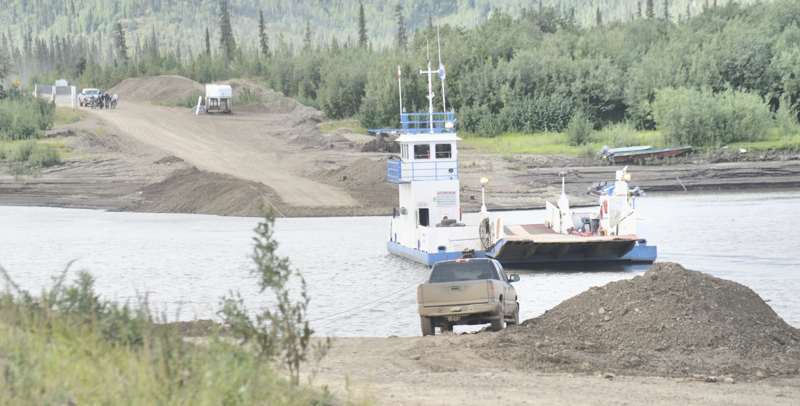 ^ The southernmost ferry crossing on the Dempster, of the Peel River at NT 8 km 74. By this point of my trip, my truck's side and rear windows were completely covered in dirt kicked up by my tires and other traffic. So the young boy with the squeegee, who washed my windows while we were crossing the river, was much appreciated and well-tipped. And his mother, the captain, didn't have to worry about childcare! ^ On the southbound highway, just before the Mackenzie River ferry crossing, is the only NT 8 route marker I saw on the highway in either direction. I'm not sure whether the greenish tint is how the sign was originally painted (I've seen similar markers elsewhere in the Northwest Territories that were more definitely green rather than the usual blue), or rather due to sun fading. 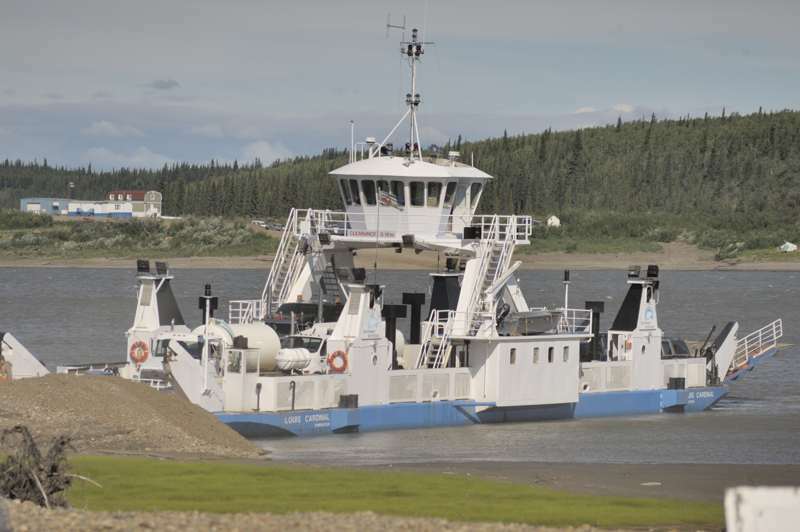 ^ The Mackenzie River ferry, at NT 8 km 142.5. This crossing will sometimes include a side trip to the village of Tsiigehtchic, on the south river bank a little upriver from NT 8. ^ A view of Campbell Lake, from NT 8 near the Tithegeh Chii Vitaii lookout at km 232.3. 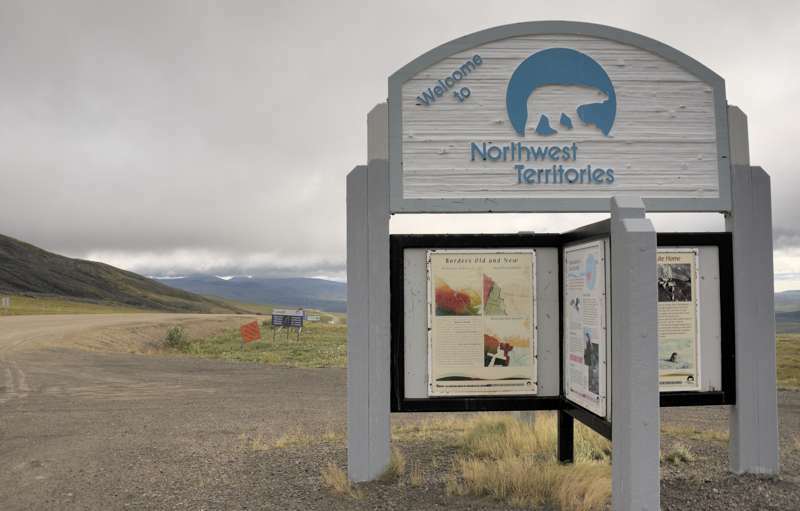 ^ Approaching the turnoff to the Inuvik airport is this weigh station advance sign. This the only sign I saw on my 2012 trip mentioning the Dempster Highway's route number in NT, other than the lone reassurance marker shown above. 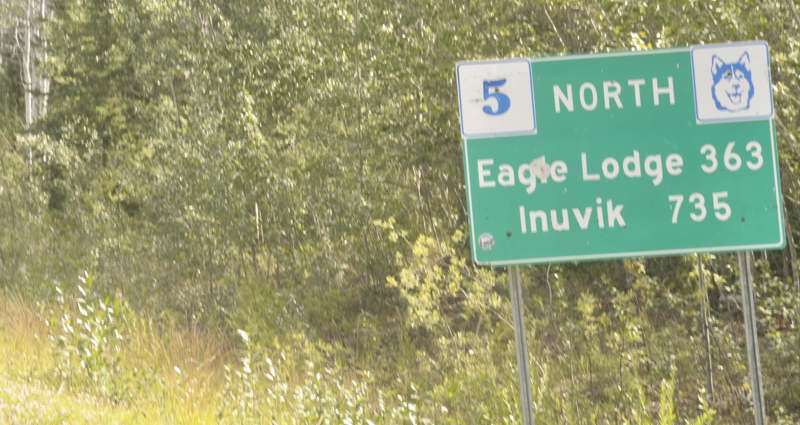 ^ First southbound distance sign on the Dempster leaving Inuvik, this one right after the airport turnoff at km 259.2 (photo taken August 2018). 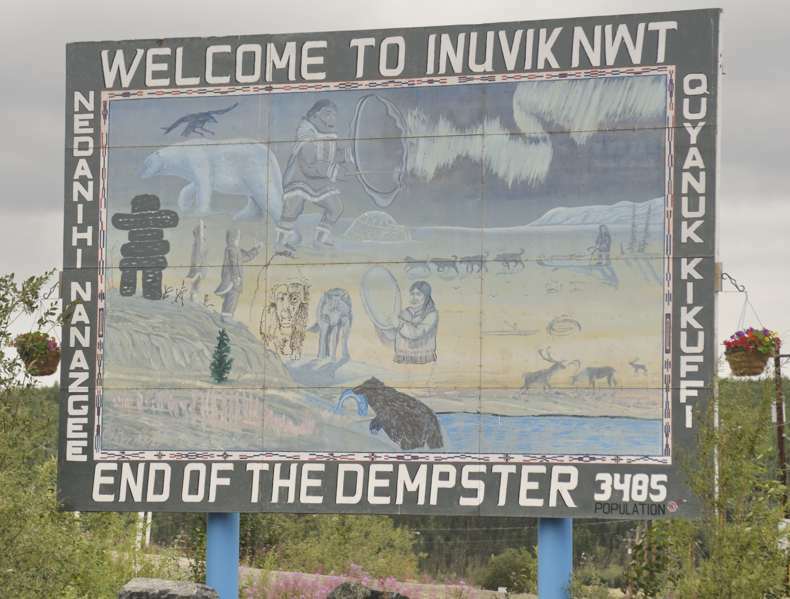 ^ This Inuvik welcome sign is not quite at the end of the Dempster Highway, but it is pretty close. ^ The Mackenzie Road (unnumbered territorial highway Inuvik Access Road) spur into downtown Inuvik splits off to the left at this intersection, at NT 8 km 269.1. NT 8 continues ahead and uphill on the Marine Bypass Road. 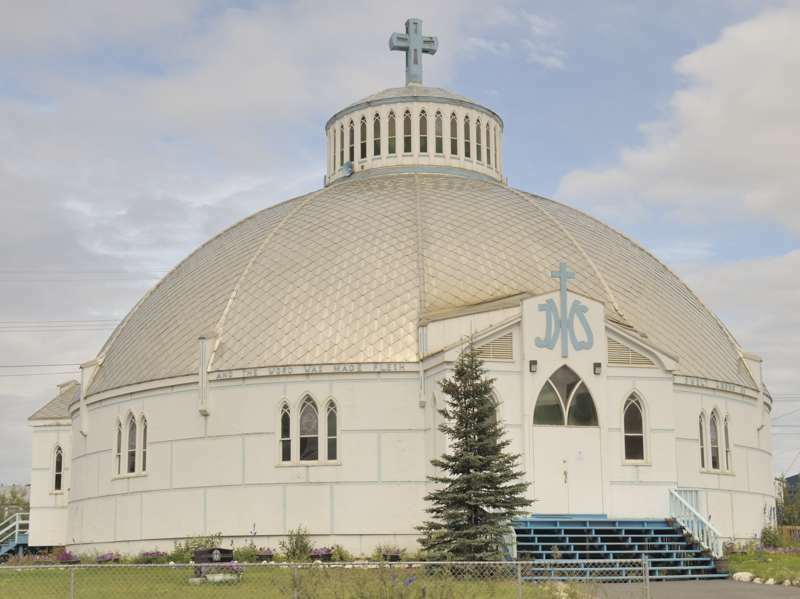 ^ On Mackenzie Road is the most notable landmark in downtown Inuvik, the "Igloo Church" (Our Lady of Victory Catholic Church). 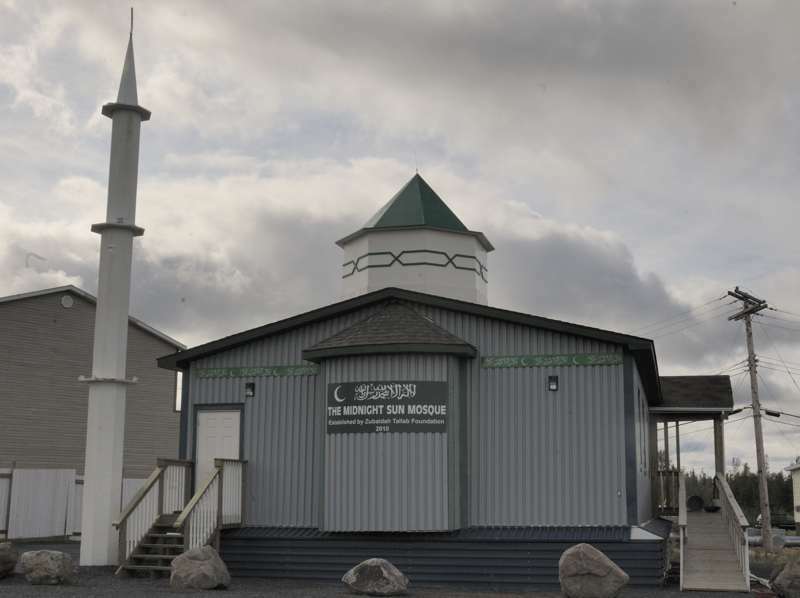 ^ Also in Inuvik is the northernmost mosque in North America. It reportedly was built in Winnipeg, then trucked and barged up to Inuvik. That raises the question of how religions whose holidays and other observances are keyed to sunrises and/or sunsets, handle places such as those north of the Arctic Circle that sometimes don't have either for weeks at a time (24-hour daylight around the summer solstice, 24-hour darkness around the winter solstice). For Muslims in Inuvik, the typical accommodation is to use the more normal sunrise and sunset times in Edmonton. ^ One of many "utilidors" in Inuvik, where heating and sewage pipes and other utilities run aboveground, to avoid subsurface permafrost. 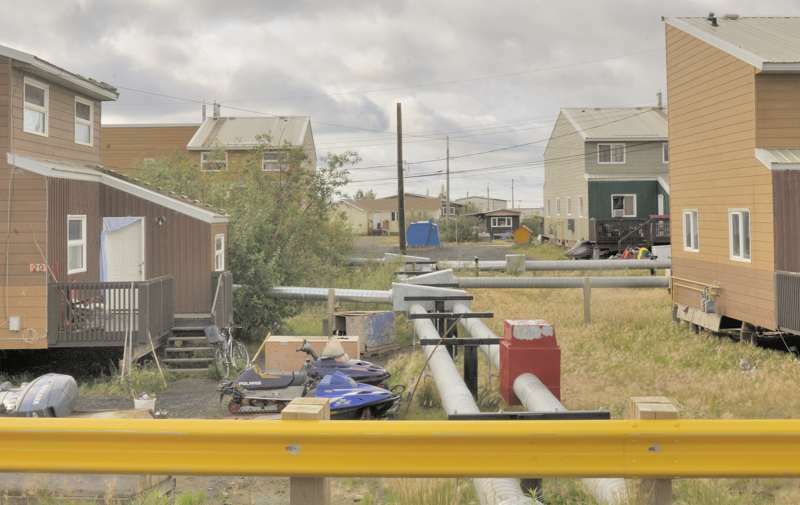 Many buildings in Inuvik are also on stilts, so their heat doesn't melt the ground beneath. ^ Back to NT 8, km-post 272 on Marine Bypass Rd., northwest of the Centennial St. intersection, confirms that the Marine Bypass is part of NT 8. ^ Here the Dempster ends, at its intersection with Navy Road in Inuvik (photo taken August 2018). 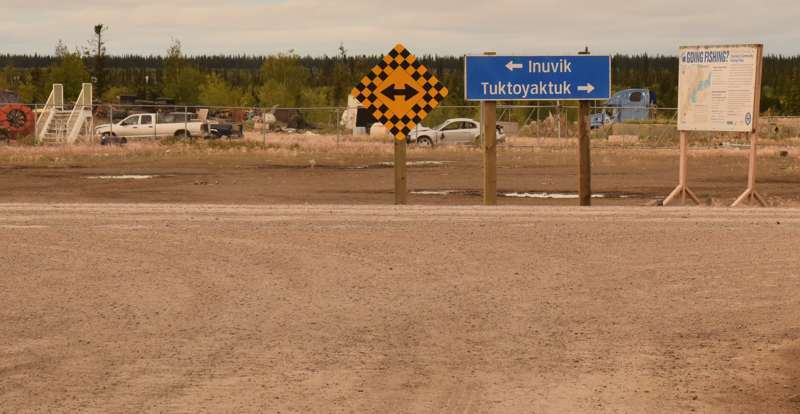 A right turn takes you to the new Inuvik-Tuktoyaktuk Highway (NT 10), though that technically doesn't start until about 5km north of this intersection. Wow. Just wow. Very nice! Seeing the pipes aboveground and the structures elevated in the same way struck me as a great way to deal with permafrost. Kind of funny to think where permafrost does not exist that if you want to keep pipes from freezing, you bury them! So the young boy with the squeegee, who washed my windows while we were crossing the river, was much appreciated and well-tipped. And his mother, the captain, didn't have to worry about childcare! Yeah... I found that a bit strange. But just a bit. Another way is to build your structures atop bedrock. IIRC, that's what was done with the Eagle Plains truck stop, to avoid any permafrost issues. Still another option is to use heat pipes to refrigerate the ground under structures, as was done with the Trans-Alaska Pipeline (which also has some segments built on bedrock). Some great pics ... thanks for sharing! Looked like one heck of a driving adventure.